A SWOT analysis is a study done by an organization or company to find their strengths, weaknesses and external opportunities or threats. Whether you're starting a business or have been at one for a while, it's always good to be self-aware. And, it might just help you revitalize your endeavor. But, how do you know when it's time to reevaluate? Doing a SWOT analysis may just be the right move, whether you have personal reasons, or your business could use some help or is contemplating an action. But what is a SWOT analysis, anyway? And how do you know when you should do one? A SWOT analysis is an evaluative process that individuals or businesses conduct to find out their position, especially how competitive they are to other companies or when going for a new job or career move. So, a SWOT analysis entails examining that company or individual's strengths, weaknesses, external opportunities and threats (hence, the moniker SWOT). Both strengths and weaknesses are internal, while opportunities and threats are external. But a SWOT analysis is an integral component and asset in a company or individual's arsenal that can provide a lot of important information to be used at the company's inception -- or at any point during its lifecycle. An entity (usually a company or business, but also sometimes an individual or other entity) will typically conduct a SWOT analysis to assess the state of the company, etc., often before considering some action like expansion, and can help increase things like market value or share. For these reasons, SWOT analyses are strategic tools that can help a company or individual plan for the future. And, SWOT analyses use environmental data and information to help assess both internal and external factors that may contribute to or hinder the company's success or growth. It takes into account both controllable and uncontrollable factors, like how the market or the government can influence the company. These are therefore key aspects of doing a SWOT analysis. Typically, a SWOT analysis is conducted in a group setting, with a leader facilitating the discussion. SWOT analyses are often recorded for reference, especially at large companies where group sizes may be formidable. For a business, doing a SWOT analysis can help reorient or even create priorities by understanding all the elements that contribute to the company's success or failure -- even if it is preventative. When analysts create a SWOT analysis for a company or organization, they put all four components -- strengths, weaknesses, opportunities and threats -- into four quadrants in a square, which is helpful in weighing things like how many opportunities versus threats a company is facing. 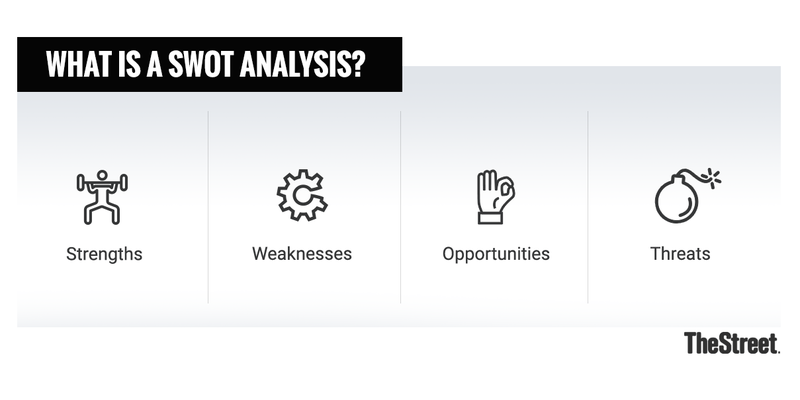 Even though SWOT analyses are often done for companies or corporations (and other such entities), they can be just as effective and helpful for individuals to conduct on themselves. In fact, conducting a SWOT analysis on yourself can be a great way to provide insight into your assets and challenges, especially when wishing to improve your performance at work in light of a raise or other opportunity, or even when gunning for a new job. In the same vein, a personal SWOT analysis utilizes the four aspects -- strengths, weaknesses, opportunities and threats -- but applies them to the individual instead. So, for a personal SWOT analysis, you may outline your strengths -- like being punctual, having a degree or years of experience in a certain career field, or being a good writer -- and then progress to analyzing your weaknesses -- which could be things like not being proficient in a computer program, having a short temper, or needing to work on interpersonal skills. These things are the internal aspects that you can control or improve on, and should be viewed as things you can use to your benefit (as assets) or as opportunities for growth and improvement. When conducting a personal SWOT analysis, you should also examine the external factors involved, so as to best assess yourself and help give yourself a realistic view of what you could accomplish. Both opportunities and threats are things that are external. So during a personal SWOT analysis, you might examine threats like other candidates for a job that have training that makes them more valuable, and compare it to an opportunity like getting a certification for that training that will make you more competitive. The beauty of a personal SWOT analysis is that it is a simple and easy way to position yourself for climbing the career ladder or improving your performance at work. As mentioned earlier, a SWOT analysis compiles both internal and external factors to give you or a company a better look at their situation, assets, goals and obstructions. When conducting the analysis, a business or person should create a list of all the factors that are internal (on the SW side of the SWOT) and the things that are external to the organization (the OT side of the SWOT). Within the SWOT analysis' 2x2 square, the first two sections are strengths and weaknesses -- and represent the internal factors or assets of the company, organization, or individual. Internal factors include resources, experiences, and assets. For example, a company's internal strengths and weaknesses could be things like great customer service and a popular product line, or poor branch management and an employee lawsuit, respectively. These are factors inside the company that contribute to its current success (or failure) and are assets or challenges the company has. The external factors are the latter two sections of the SWOT analysis and include things that comprise the environment the company, organization, or person is in. For example, things outside of a company or organization's control could be things like the economy, varying consumer trends, new competitors, or changing regulations. In this case, external opportunities could include being able to ship to or trade with a new country if tariffs are lifted or changed, and a threat similarly could be having supply restricted from a country with bad economic ties to the company's home base country. A SWOT analysis should be to-the-point and simple, so as to avoid confusion or over analyzing. Still, they are very easy to conduct. It is important to first delineate who will be part of the SWOT analysis group. Project managers and upper management are most often involved in the SWOT process, but this will obviously vary depending on the needs of the organization or company. Once a group is compiled, it is often helpful to have a leader or facilitator in charge of the discussion and writing process. And, SWOT analyses are frequently done on corporate retreats or in a designated session so as to avoid distractions and ensure everyone is focused. It is important for everyone to be honest and realistic when creating the SWOT analysis for the best results. Once a team is assembled, have someone draw or create a 2x2 square with "strengths," "weaknesses," "opportunities," and "threats" in each box or quadrant. If you would like to record your session, begin recording or monitoring the session. At this point, the group should begin discussing things about the company that fit into each category, thereby creating a company profile. This will give everyone a good idea of what the company is working with and will later help when discussing opportunities. In large companies, it might be helpful to segment the SWOT analysis for specific areas in the company. And, even if the company is not large, it could help to section different areas of the company off to get a better view of the particulars of the business. Once the group decides how they'd like to break it down, begin facilitating discussion to fill each box, taking note of different department heads or managers who may have more particular knowledge of certain areas of the company. When filling out each section, note the difference between internal and external factors, and pay special attention to how your company could leverage the strengths it possesses to create new opportunities or fix problems. It might be helpful to have groups break off and discuss for 30-minute sessions. Have everyone in the group assess the company's strengths first. What does your company do well? What assets do you have? How do you manage your resources? What can your company leverage for its benefit? Strengths could include things like a strong product line, high customer satisfaction, a sizeable share of the market, few competitors in your industry, or high employee satisfaction. Next, have the group discuss what the company's weaknesses are. Be sure to facilitate an honest and rigorous conversation so as to understand your company's situation as clearly as possible. Weaknesses a business could have include things like low capital, a high turnover rate, low employee satisfaction, a decreasing stock price, or product recalls. Then, have your team discuss what opportunities the company has. This could be with a particular goal in mind (for example, the company may be getting ready to expand or venture into a new industry or product line), or it could be in response to a change in the market, sector, regulations, or even economy. Opportunities could include things like the retraction of tariffs opening up a new supply or export stream (and therefore a larger market share and margin), or acquiring a new company and gaining a new customer base. Once you've established your company's opportunities, examine the threats that face your company. These could range from a competitor releasing a comparable or better product, to new legislation, to trade wars. Group members may not consider everything, as external factors are often examined less than internal ones given that internal factors are much more obvious in the day-to-day operation of the company. However, make sure to examine as many threats as possible in order to best understand your company's position. Then, it may be helpful to come up with strategies to avoid or negate these threats. For example, your group could acknowledge that legislation restricting the use of a certain product that is part of your supply chain could threaten your company's product, but a solution may be to switch to another product that might be more easily attainable, if possible. For example, a made-up company, Thompson Motors, is a small motorcycle company based in California. Their margins are increasing, but due to other big competitors opening up new stores in the area, their customer base is starting to slowly shrink. Still, given an opportunity, the company wants to expand, and decides to conduct a SWOT analysis before moving forward. After meeting as a group, the project managers and other execs come up with a SWOT analysis. Strengths: The company has a very loyal customer base who provide free advertising through social media and word-of-mouth rave reviews. Additionally, the company increased their margin by $1 million from the previous year, and have been able to increase their market share over the previous quarter. And, the corporate culture is very positive, according to employee polls. Weaknesses: Although the brand has high loyalty, the company is still fairly small and is frequently getting beat by bigger brands like Harley-Davidson (HOG - Get Report) . The company also has had a couple of employee complaints about certain people in management, resulting in an investigation. And, one of their production plants recently failed a safety inspection. Opportunities: One of the company's direct competitors -- another small, family-run motorcycle company -- went out of business, opening the door for an increase in market share. And, Thompson Motors has the opportunity to buy out the company to increase their customer base. Threats: A recent fatal motorcycle accident in California that received huge publicity has reduced the number of people buying motorcycles. And, several new Harley-Davidson shops recently opened in the area the company is primarily located, largely increasing competition. Once Thompson Motors creates the SWOT analysis, they are able to better understand their situation and can move forward with the buyout once they fix the problems their company is facing. For more examples, check out Coca-Cola's (KO - Get Report) SWOT analysis.